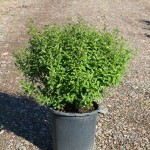 A bushy shrub with dark green foliage, often used for borders and hedging. 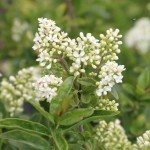 The white, late spring flowers are held on small panicles. This plant is easy to grow. It prefers full sun to part shade and most soils. Shear after flowering as needed for form.